Participants will experience the time-domain and frequency-domain views of various signals, ranging from simple to complex—including chaotic and noise waveforms. They will also learn the metrology of signals, and noise, in the frequency domain; the Fourier picture of recovery of weak sinusoidal signals immersed in noise will illuminate why lock-in detection works, and will also illustrate the meaning of the unit V/√Hz. 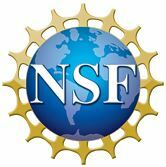 Participants will acquire skills using the TeachSpin curriculum, and apply them to experiments in acoustic resonance, fluxgate magnetometry, or coupled oscillators. Participants may bring a laptop, and are welcome (but not required) to bring along a favorite or familiar oscilloscope; the rest of the necessary equipment will be on hand. Costs of the experiment: to replicate it as it will be used in the Immersion would cost $8k. Some, even many, of its ideas can be replicated at much lower cost, given a digital oscilloscope with FFT capability; of course, that way, lots of objects and systems would have to be improvised. 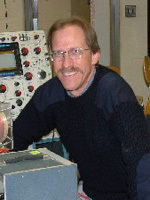 David Van Baak is Professor Emeritus of Physics at Calvin College. His academic career included teaching and developing in the advanced-lab at Calvin College from 1980 through 2014; and since 2005 it has included collaborations with TeachSpin. Since 2014 he has been full time at Teachspin. The Fourier transform no longer belongs just to theorists! The fast-Fourier-transform algorithm, and real-time data acquisition and digitization, now make the Fourier content of real-life laboratory signals transparently visible in table-top laboratory investigations. His experience with such technologies has included a 1991 ILIP grant for Fourier Methods across the curriculum, and has progressed to involvement with a commercial release of a full Fourier-methods teaching package. 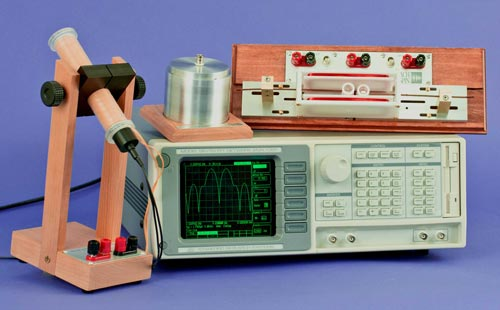 If voltmeters and oscilloscopes represent fundamental data-acquisition tools, and if a lock-in amplifier stands for advanced capabilities, then a Fourier analyzer is a wonderful intermediate-level tool for visualization and measurement which physicists ought to acquire and pass along to their students. Quite apart from teaching signal-processing capabilities of remarkable sensitivity and resolution, this Immersion will reinforce the skills of the Fourier way of thinking, and will (ideally) addict each participant with the routine use of a Fourier analyzer in laboratory diagnostics. Dr. David A. Van Baak, Teachspin, Inc., 2495 Main Street, Suite 409, Buffalo NY 14214-2153. Email: dvanbaak@teachspin.com. Telephone: 716-885-4701.